Hey folks! Just wanted to let you know that as of September 13 this offer is closed. If you really like the idea let us know, we'll bring it back in the future! We've spent the past year continuing to develop our Q-bank. We now have over 1,500 questions for Step 1/COMLEX exams, and over 1000 questions for the Step 2. We've also used this program to create practice exams for all the boards, and most of the Shelf exams. New in Firecracker: A Q-bank of 2,200 Test-Style Clinical Vignettes. 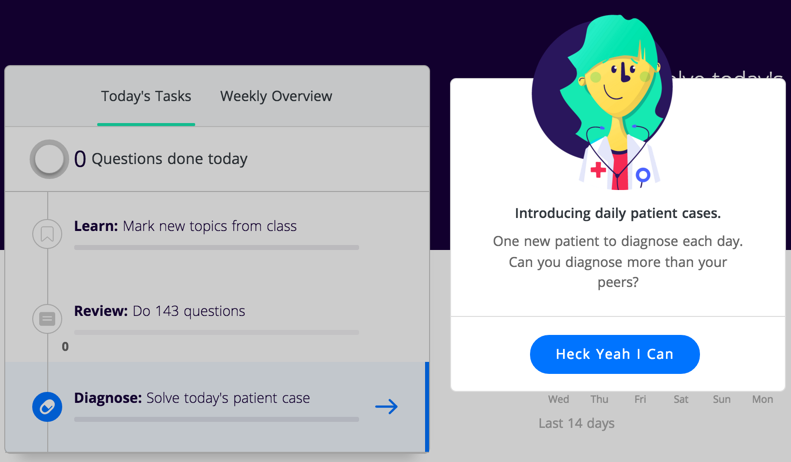 We’re excited to launch the first wave of our new Dedicated Test Prep (DTP) features: Firecracker’s Q-bank of 2,200 test-style clinical vignettes. You can now access these CVs directly from Study Something Specific by going to the subject area of the content tree you’re interested in assessing yourself on, selecting the number and type of CVs you want to attempt, and then working through them in the same exam-taking experience you’ll encounter on the actual board exam.